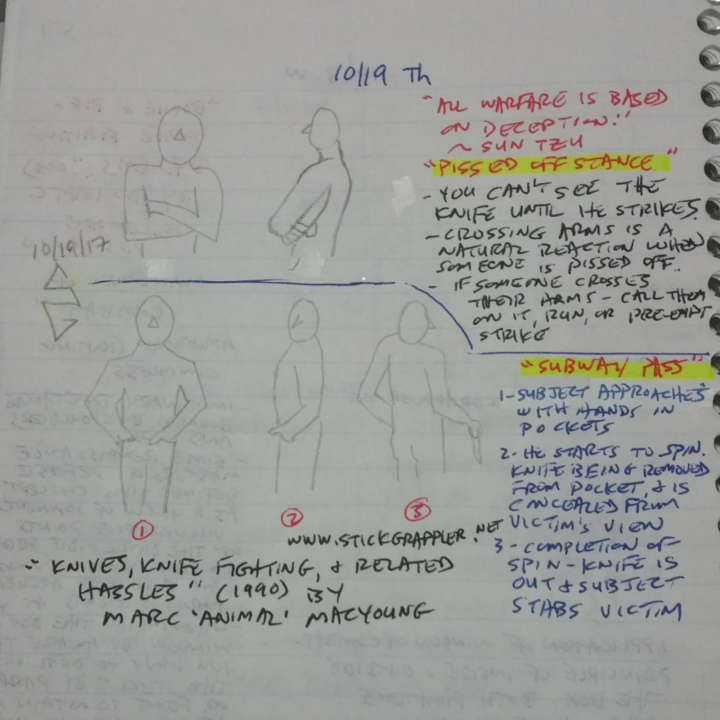 Day 19 of Inktober - so far, I'm having fun reading/re-reading some of my knifefighting/martial arts/self-defense books. I'm also having fun practicing my 'gesture drawing' also. My drawings are not perfect, but they serve its purpose for me. Like a mental bookmark ... some loose and fast drawings to jog my memory ... like humming a few bars of a song. And on that front, they are perfect for me. Know what I mean? Today's picture/topic is the hidden knife. I hope you all are finding my drawings and notes useful in your martial journey! Crossing arms is a natural reaction when someone is pissed off. Subject approaches with hands in pockets. He starts to spin. Knife being removed from pocket and is concealed from victim's views. Completion of spin - knife is out and subject stabs victim. Anyone with a knife looking to assault you will conceal their blade. This is not like the movies where the subject will brandish a knife to intimidate. As you can see from my picture above, sometimes the hands are in sight, yet, they can still hide a blade. Be aware! Learn to read the tell-tale signs of impending violence. In poker, the signs to look for to see if a player is bluffing are called 'tells'. Gavin deBecker calls them PINs (Pre-INcident indicators). There are four techniques often used by attackers, especially muggers and rapists, in preparing victims for attack. Although these are nearly always overlooked by self-defence writers, the four 'D's – dialogue, deception, distraction and destruction – are the most important element of self-protection to be aware of. Dialogue designed to disarm and distract the targeted victim is the professional attacker's most common priming technique. An attacker will approach a potential victim in a non-threatening way and begin a conversation. Often, he will ask a question about directions, ask if you have the time, a light, or any spare change. His objective is to make you think about his question, so that you do not notice the weapon he is drawing or his accomplice coming round behind you. It only takes a second of distraction for you to get into deep trouble. Understanding this will make you more aware and keep you alert, which is the most important part of target hardening. An attacker uses deception to make himself appear harmless. Dialogue and appearance are the most common methods used to deceive victims, to make them let down their guard. Do not expect dangerous people to stand out in a crowd. Attacks may start with politeness, even with an ingratiating approach. Deception is the attacker's greatest asset. Every attack I have ever documented that was not a blind-side attack (the ones that happen when you do not use awareness) came through deception, the attacker using this as a window of opportunity. If the distraction is submissive, 'I don't want any trouble, can we talk about it?' it will also take your assailant down from a state of fight or flight to one of low awareness, because your submissiveness tells him that the danger is over and he can relax into self-congratulation. Brain engagement, via disarming/distracting dialogue, gives the victim a blind second. This is when the assailant strikes. 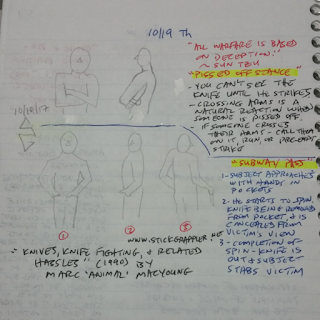 The distraction is also used by the experienced attacker to take down any protective fences that may have been constructed by the victim (the 'fence' is dealt with in detail in a later chapter). This is the final product of expert priming. Few people survive the first physical blow and most are out of the game before they even realise that they are in it. Even trained martial artists often get suckered by the four 'D's because these do not appear on their training curriculum. They do not understand the enemy they are facing. The attacker uses the techniques of deception and distraction to prime a victim that is only trained in 'physical response'. When the destruction happens, most people have no idea how brutal and quick it can be. "Assaults happen closer, faster, more suddenly and with more power than most people can understand." Do not let 'unknown contacts' get close to you. Maintain some reactionary gap... put up your 'Fence' if you have to ... establish your boundaries. Be ready to run if you can or pre-emptive strike if the need arises. Martial Arts -- and expect to get cut. Once you cannot see an unknown contact's hands and they are approaching you, usually joking, laughing and smiling, be mindful of what these signs can mean! One sign may be nothing, two signs and your spider-senses should be tingling mildly, three or more signs and you should be like Robby the Robot in the classic sci-fi TV series, "Lost in Space": "Danger, Will Robinson!" THE FIT WILL HIT THE SHAN!!! Now you know why Police Officers always say, "Let me see your hands!"